We often wonder if we could find the truest of friends. We have read so many essays and have heard many thoughts about friends indeed, yet a hole is left in our hearts wherein we ceaselessly find the true meaning of a friend indeed is a friend indeed. Some have been maimed, killed, jilted, dumped dejected and sorrow-filled through so-called friends. Some lives have been enmeshed in untold pain and agony as a result of friendship. The more we chorus “a friend in need is a friend indeed,” the more some would totally see it as a lie of the century. Why wouldn’t they, when they have trusted friends with all their lives only to be disappointed and betrayed in the end? Wait, is that how you feel? If yes, then I just must say I understand. But… no matter how you feel, it wouldn’t change the fact that there are real friends that would want to be everything for you. If you have been finding yourself in the midst of enemies that present themselves as friends, I see change coming your way. I see you having the friends that want to be everything for you. Amen. While writing this piece, I came across “A friend with weed is a friend indeed,” and I just smiled. To the people in that school of thought, a friend who gives is none else but a friend indeed. They understand friendship through giving and, no doubt, that’s it. 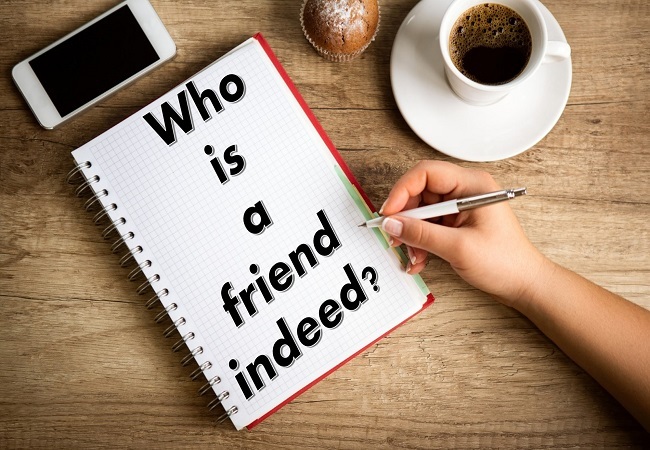 A question for you: What is the true meaning of a friend in need is a friend indeed? Let’s find out together from the following paragraghs. I have known about tango, that it always takes not one but two. I have seen a helping hand, and when two, what a wonder they can do. I bow in awe, seeing how lovely having great friends could be. The one who has but one, has wealth untold, and boundless of peace. Do you really know how it feels? Seen its wonders and its deals? Let’s read each line of the following conversations, carefully. Tade went to the university he graduated from, to get his certificate. On getting there, he was asked to pay some amount of money which had to be through POS (Point of Sale machine). He only had enough cash on him but no ATM card to be used for the payment, so he called a friend to help. Francis was the one friend that came to his mind and so had to state the help he wanted him rendered. In few seconds, it was done. As usual, Francis picked his cellphone, called another friend of his, and the following conversation ensued. Francis: (on the phone with Mark) Hey, Mark, Tade just called me now. Imagine that his school. Said he brought cash to be paid to get his certificate but they wouldn’t take cash. He left his ATM card at home. Why would he have to carry his ATM card about when all he would spend in the next one month would be inside his car? He sent me one guy’s account details to send just 5k (five thousand) to him. I sent him 50k (fifty thousand) anyways. Mark: You this guy, you know how to tap blessings alone! I will send more than that, now! *You can’t give Tade anything and not see instant result. * Aside that, what are friends for? It’s just that the owner of that account will be over 100k richer today. Because, I know he will only pay 5k out of the money and hand over the ATM card to the owner. I will send him 77k (seventy seven thousand). Don’t be annoyed o. The blessing go complete be that. How does the conversation above make you feel? In case you don’t know, that’s an example of friends indeed. Now look at this in another form. Francis: Mark, Tade just called me now that he needs 5k. Mark: 5k? You mean 5kobo? I don’t know when last I saw 1k last self. I had a dream overnight that my bank called and advised me to come close my account. Francis: Guy, God will help us o. My children are at home for a week now as I don’t have money to pay their school fees. Let’s just pray for him. And God will send a helper. You see, if a blind man would choose between the two categories of friends above, a deaf and dumb would sternly advise him to pick the first. Even your shadow can tell why. The other day, I was inside the room with a friend and we began to see the Future in view. We had long talk and some really resonated in our hearts. Bro, imagine you want to get married now and while planning the whole stuff, I just called and began to say this…. On hearing that, he only did sigh, shook his head in awe and wished that would be realistic enough. Think deep, personalize that and think of many things you could do effortlessly with the help of a friend. You want to get married? You want to set up a business? You want to build a house? You need help of all sorts? God can use just a friend. A woman was preparing for a ceremony such that would have been untold shame for her, if she had failed to make it befitting enough. Seeing her purse, she decided to go borrow some money, since she didn’t expect help from anywhere. There was his son who was doing as though not bothered about his mum’s plan to owe that she could make a party befitting. She made a visit to the son and was shocked when he sent all the money needed for the ceremony into her account. Right there in front of the son, she picked her phone and called the one to lend her, that she wouldn’t be needing the money anymore. The ceremony was over and she had more money left. God used her own son here…. God can use a friend for you. Are you still there? Okay, here’s more. No matter what level of (whatever) you are in now, it takes God only a second to get you to an unmerited pinnacle of greatness, comfort, blessing, fame, wealth, name it! But….. He is still in the business of using people, and not just Angels. And the last time I checked, your friends are such that can be used. You see, the one reason you don’t desire the best of home, cars, wedding, properties, is because you know how limited you are financially. Oh! You will trust God instead? I love that. But He will use people for you since He wouldn’t come down himself to bless you. I know you want to be richer than all your friends, yet you need a help to get to that height. Otherwise, perpetual limitation is looming. The answer to that question is in the corners of your mouth. If you believe, good; if you don’t, good as well. Because, they could be the help you need tomorrow. I look forward to receiving a call from you, through which you would promise to take care of a huge project I want to embark on. That is who I want to be too. Amen. I sat down and thought about this. I did ruminate on it and was made to see how selfish I have been all along. I just hope you have not been like me. But…. I don’t want to be selfish any longer. So, do you have something you would want me to help you with? Is it about your relationship, marriage, career, or business? I am here, in humility. Adorned for the service of friends.